Digital photography is penetrating deeper and deeper into our everyday life. Not so long ago a digital photo camera was just a stylish toy, and today it is a rather ordinary device, a choice of millions. But the problem of storing photos outside is still urgent. Modern memory cards have already reached volumes sufficient for home use. If earlier you had to buy several films and think well before making a shot, now you can go with a memory card of 512 or even 256 MB which runs into several hundreds JPEG shots (especially in case of a relatively low resolution). Then you can download the photos to your computer and then use some inexpensive storage media, for example, CD-R. But what if you don't have a computer at hand for a long time? If you make TIFF shots (512 MB cards on the 4MP cameras allow only for 40 images) or RAW for the highest quality? Taking into account that 1MB costs about 35-80 c, it's too expensive to carry with you several gigabytes of flash memory. Microdrive is not a wayout here. Although it is cheaper, in case of large volumes the price will go too high anyway. As a result, many photographers have to buy notebooks, but such machines are not small and have many other functions which must be paid for as well. Besides, inexpensive (i.e. old) notebooks which are usually bought for such purpose have a very short operating time. Memory card slot. The most universal is PCMCIA, but a CompactFlash will do as well because there are adapters for other card types. Slots for other cards is a plus (it allows saving on adapters) but not necessity. Computer connection interface. At least, standard USB 1.1 (the most popular), but a speedier one would be better. Built-in rechargeable battery. The hard drive consumes a lot of energy in the data recording mode, that is why the battery's capacity must be as large as possible. In general, it must be able to record at least the same data volume the flash memory of the price comparable to the drive can house. But it is minimum, when you must think well before buying such a device. It's much better if the drive can record at least 1.5 times more than microdrives of the same cost. For example, if a certain drive costs $500, its battery must be able to record at least 3GB. Besides, there must be an external power source to charge the battery and not to use it if a wall outlet is within reach. The battery supply, if it doesn't make the drive too weighty, is a good add-on. Additional features: an LCD display (for viewing photos and managing the collection), TV connection, universal expandability would be a plus. It's not necessary but at a rational price it's an advantage. Such drives are in demand, and the market does offer them. One of them was reviewed half a year ago, but the MindStor had a short rundown time and some other unpleasant features. Today we will take a look at three more drives. Why three if the heading indicates four? Well, it's a long story. 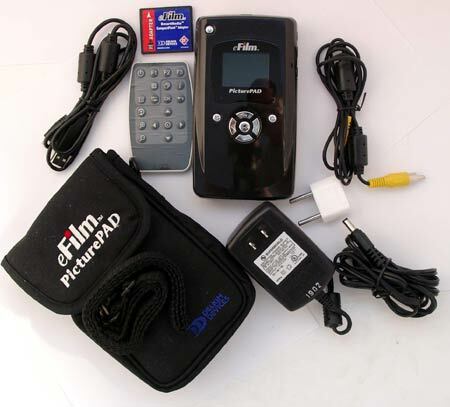 First, I wanted to write about the Delkin eFilm PicturePAD. 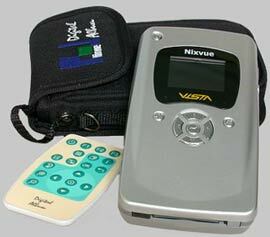 When the device was tested and reviewed I got the chance to test the Nixvue Digital Album. So, I had to rewrite the article. When I was finishing the work, it turned out that the next Nixvue's solution was arriving very soon. And I put off the publication. I thought it was deja-vu when saw the VISTA. The express test proved it because the drive differed from the PicturePAD only in the body's color (Nixvue's silvery instead of Delkin's black) and an accessory pack. The price and service were also different, of course. Well, it was the same device shipped by different companies. When the review was remade, I got the X's-Drive. The drive was far different from its competitors, and it was impossible to simply adapt the article. So, I was either to write a new review of all the devices (which wouldn't be fair regarding the PicturePAD which had to wait so long) or publish the finished one and write a separate review of the X's-Drive (which wouldn't be fair in respect to our readers). Well, your interests prevailed, and here you can see the final review far different from the original one. Now, when we are through this a bit lengthy introduction, let's have a closer look at our heroes. This is one of the first devices of this class, but it is still popular these days. The drive is compact - 146 x 82 x 29 mm at the weight of 280 g. There are 5 buttons and a black-and-white LCD on the front panel, which makes it very handle. Inside there can be a disc of 5, 10 or 20 GB. The benefit of a 5GB solution is questionable, because the volume is not so great to justify the price and dimensions. The 20GB is much more interesting - the dimensions are the same, the price isn't 4 times higher and the disc size is greater than many inexpensive notebooks have. The PCMCIA slot allows connecting any card types via inexpensive adapters. Taking into account that CompactFlash is a main format in digital photography, the CompactFlash Type I adapter is supplied. Together with the dock the device is more communicative: its back has USB, LPT (for direct printing of photos on many color printers without a computer), TV-out and a power supply connector. But the fact that it adds to the weight is not pleasant. All disadvantages of the Digital Album were dealt with in the next drive named Vista. It's a very successful, though expensive, model; Delkin also sells this drive under its trade mark (Digital Album is not promoted any more ;)). Let's look at the differences. The drive is only 2 cm longer - it measures 168 x 82 x 29 mm, and a bit heavier as well - 290 g (i.e. 10 g more). But as a dock station is not needed, the drive is actually more compact - now we save on the space in bag and on weight (250 g). USB 1.1 and power supply connectors and TV-out are on the drive now. The only missing connector is LPT. But don't worry - many modern printers do not have it any more, and the company has something more for it. The drive now has an Option Slot meant for various expansion modules. Do you want direct printing? Well, just get an appropriate module and start printing. 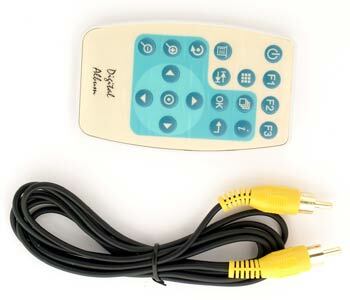 You can also attach an MP3 module and listen to music. If you think that the USB 1.1 is too slow, there are modules that support operation via FireWire, USB 2.0 and even Ethernet. Some of the above mentioned modules are already available (at the time of testing I couldn't get, however, high-speed interface modules), some will arrive in the second quarter. Maybe, some more modules will be developed. By the way, the slot is similar to the one of the Digital Album. Maybe, the Digital Album can be also expandable to some degree. But I can't affirm it. Maybe the firmware version prevents it; it is upgradable in both drives, but I don't think the proper version will be made for the Digital Album. 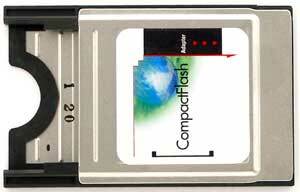 Besides, PCMCIA is replaced with CompactFlash Type II. I think, it's a right step - those who use CF, don't need adapters now (the adapter coming with the Digital Album didn't support Type II, and those who needed it had to buy it). Other cards' adapters are available at the same price - either for CF Type II or for PCMCIA. There are 8 buttons instead of 5. The display is color, backlit, and displays not only the menu but also photos. Although 1.8" is not for admiring photos, it can't be useful for example for quick viewing. The view parameters are the same as with TV; even EXIF can be displayed (which is even more useful than simple looking though shots at such resolution). Other features were added just to justify the price :). The Nixvue comes with 5, 10, 20 and 30 GB discs, while the Delkin's solutions can carry 20 and 30 GB. Well, in all respects the drive is better than its predecessor. The list is the same for the Vista, but the Picture Pad comes with two more things. First of all, it is a SmartMedia Card Adapter. By the way, in such cameras the storage problem is even more pressing compared to the CompactFlash. I also found the CD with Adobe Photoshop Elements 1.01. This is a light version of the Photoshop 7.0 but I haven't found any huge disadvantages, and it's even simpler to work with some functions of photo processing. Besides, one shouldn't look a gift horse in the mouth :). Delkin gives a legal copy of the packet, and we don't have to use a pirated one or pay a price comparable to the drive. This drive is fundamentally different from its competitors. 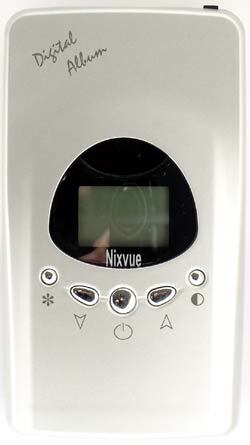 If the Nixvue is an expensive device with as many functions as possible, this one is as cheap as possible and supports only necessary functions. The drive is similar to its counterparts in dimensions: 130 x 75 x 25 mm, 288 g. No dock station is needed, like in the Picture Pad, a USB connector and a power supply jack are right on the drive's body. 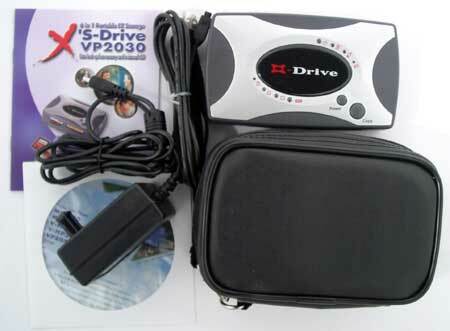 The X's-Drive sports slots for CompactFlash Type II, SmartMedia, MMC/SD and Memory Stick. On the other hand, it's still not universal: you will have to buy an CF adapter for xD Picture Card or Memory Stick Pro. It simply cost nothing for the developer to provide the support for several standards as the drive is based on a multifunctional one-die controller which made a good showing in multiformat card readers. 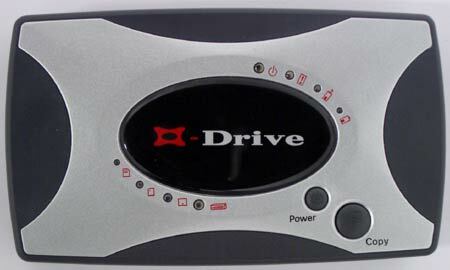 The drive does well with only two buttons: one switches it on/off, the other copies the card's contents on the hard disc. No display. There are only 8 LEDs which inform about current processes. Nothing more - the X's-Drive supports only the most essential functions: storage and transportation of data and copying from memory cards. There are two possible hard disc sizes: 20 and 30 GB. But you also can buy the drive without a disc in case you have a spare 2.5" HDD at home. Also, it's not difficult to replace the supplied disc with a more capacious one, that is why I won't be surprised if, say, 130GB can be reached. The diagrams are obtained empirically and logically, not from the manufacturers. On the other hand, we managed to draw up the diagrams having bits of information and test data which will be useful afterwards (they will give us an idea why something is done this way, not another). Let's start with Digital Album. Here it is simple: the main controlling element is a high-speed controller which provides data exchange between components. 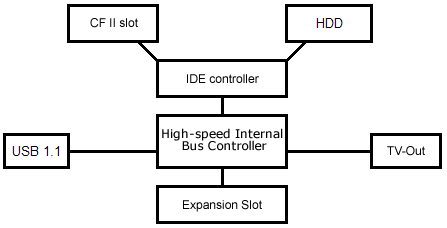 The data rate between the HDD and a memory card is limited only by the IDE controller, i.e. actually almost unlimited. There is one more component not shown on the diagram (I don't know exactly whether it is separate, and if yes - in what part it is located) which controls decoding of JPEG and other formats for file visualization. But without the dock station the device is very primitive as data can go only to its slot. Here is the dock station diagram. Having received a command from the main controller and contiguous data, the integrated controller sends the information either to USB, or to TV-out or to a printer. 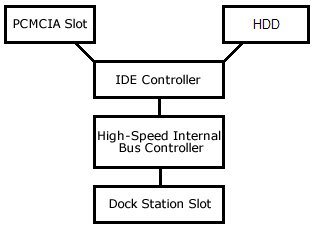 Probably, the dock doesn't even have a controller - the three components simply go to the internal bus. In the next generation the diagram is both simpler and more complicated; complicated because there are more components, but simpler because they are all in one place. Again, the visualization module is not shown (which now also supports LCD), because it's not important where it is located. It's clear why the device is so easily expandable: the expansion modules can be connected to the bus and thus they actually become an integral part of the device having an access to all its components. An MP3 player will take music from the hard disc, decode it and send to the headphones-out (or a line-in), which is provided with its connection. A printing module can get a finished image (or a file) and send it to a printer. High-speed interface modules will work as ordinary intermediaries between the internal bus and FireWire, USB 2.0 or Ethernet. What speed does the bus work at? I don't know for sure. If at least one high-speed module were available at the time of testing, I would be able to get some figures; I think it comes to 20-30 MB/s (otherwise, it made no use). It's enough for the nearest time - the internal bus is not a bottleneck yet. The X's-Drive has it different. The drive's heart is a multifunctional chip which is also used in many card readers (I have every reason to think so). Hence the inexpensive support of various expansion cards and a very limited operating speed. In the beginning the controller was developed to join memory cards with USB 1.1, and data exchange between the cards is a side effect. The operating speed wasn't vital at that time (because the first incarnation of USB is a slow bus). Now we have a low hard drive exchange rate and no expandability. However, there is a new version of this controller for USB 2.0. That is why you can wait for a new drive version if you need a high price at the minimal price. It's impossible either to add new features or to lift up the speed - pure All in One. Problems can be connected only with the Digital Album: unfortunately, this device requires drivers for any Windows version. However, the installation is easy. Just install the drivers, connection the dock, turn on the device and put it into the dock station - the new devices will appear right away: drive and one more disc device. Although there are actually two data carriers in one unit, only one letter is used: if a card is inserted the computer sees the card, if not - it sees the hard disc (such approach is also used in the MP3 player Daisy DIVA). 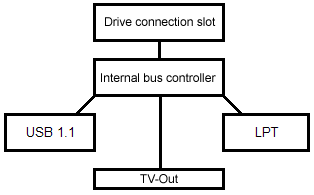 The approach is clear from the diagram: the controller sends to the bus information either from the hard disc or from the memory card. 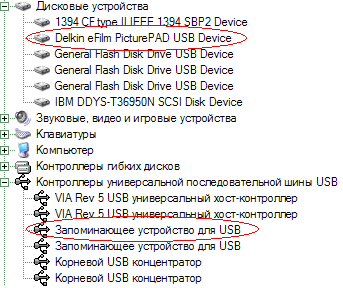 In case of the Picture Pad the driver is necessary only for Windows 98, while modern OSes (not only Windows) can do with the integrated one. Contrary to the above drive, this one doesn't connects automatically - apart from plugging the cable you can choose "Turn on USB" in the menu (why it is so is unclear - the device feels the cable: without it this item is not displayed at all). Again, there are two new devices. When a card inserted, the hard disc is not accessible. It seems that this approach will be used for expansion modules as well. Only the menu item will differ, for example, Turn on FireWire. The X's-Drive doesn't need drivers for the new Windows versions and similar systems. However, it's recommended to update the integrated driver in case of the Windows 2000, though everything works excellently without it as well - like in case of multiformat card readers PQI Travel Flash (one more argument for the version about identical controllers). The drive is identified right after the cable gets connected. There are 4 new devices in the list. Why four, if they are actually five? The controller can't provide access to more than four devices, that is why SD and MS are read by the same device. Now let's test the operating speeds and start with the USB-HDD mode. Well, access time is just tens of milliseconds. On the other hand, some flash memory products have the same, if not greater, access time. That is why it's ok. The X's-Drive is quite far. I repeated the tests several times but the Digital Album and X's-Drive proved that they write faster than read (especially the former), while the Picture Pad works vice versa. What's better depends on what you mostly do. If you use it for storing photos, then you will hardly write anything from a computer, that is why the read speed is more important. But anyway, the X's-Drive outdoes the others both in the read and write speeds. I wish I had high-speed interface modules for the Picture Pad as it could take the first place. If you urgently need to transfer data from a flash memory card to a computer which is within reach, you doesn't need to copy the data first to the drive and then to the PC - all the devices can be used as card readers. The X's-Drive is again a leader, and the gap is good enough. The Digital Album writes faster than reads again. The X's-Drive has a sound breakaway again. To all appearances, for both complex devices it's more difficult to work via USB exactly because of their complexity: it's necessary to precisely join several discrete components. The X's-Drive has only one controller for everything: it takes data from the card and transfers them via USB, that is why there are no wasteful losses anywhere. As expected, the access time of the devices that use a mechanical part is still a bottleneck. Flash memory responds at least 1.5 times faster, sometimes 4 times. It's just clear that high-speed drives are limited by the USB 1.1 bus. The data exchange rate with a computer is not that vital. Once you connected the drive to a PC, you can do something else at home while waiting for them to copy, for example, to have a cup of coffee :) But the data rate between the drive and a memory card is quite another matter: it's necessary to rewrite its contents as fast as possible to make the card available for further use (especially if the card is only one and you don't want to miss an interesting moment). If you liked the speed parameters of the X's-Drive, here is a big fly in the ointment. As I mentioned above, the speed of all exchange processes is limited by a relatively slow controller designed for speeds of USB 1.1. As a result, the internal and external speeds are actually the same, and downloading data from the card would take a lot of time. The manufacturer guarantees only about 500 KB/s, but in fact it is a bit higher. At 800 KB/s it takes 1.5 minutes to transfer data from a 64 MB card. For a 128 MB one it will take about three minutes and 512MB need about 12. The only way-out is to get an extra card so that you'll be able to shoot. Photo cameras are often supplied with 8 or 16 MB cards. If you get one more of 128 MB (or more), the old card can be used as reserve. On the other hand, 16 MB is only one TIFF. So, the drive is meant to replace flash cards, but in practice, it's actually impossible. But if you don't need badly the camera to be ready at any minute, this is not a problem. The Digital Album and Picture Pad doesn't have that problem because of a different design. As the tests show, the data rate from a card depends only on a card. Today it is 2 MB/s on average, i.e. it can take only a couple of minutes to record a 256 MB card. If you get faster cards from Transcend, Ridata, Samsung and others, the speed can reach 4 MB/s, i.e. it will take the same two minutes but for 512 MB. And 128MB need only half a minute. But two cards are still better than one, because a unique event can take place any second. How much disc space is left? The question is quite important because one has to be sure that the disc has enough space to take the card's contents before the transfer is initiated. Unfortunately, the X's-Drive doesn't help here. It has only a LED which indicates a disc operation error or memory overflow, and it's unclear what is a real reason. The Digital Album and the Picture Pad have a menu item named Disk Space or Show Free Space (with the card inserted the Picture Pad shows the card's free space, otherwise it shows disc free space). We can find out how much free space we have and how much is already taken. Errors are indicated separately on the display. The X's-Drive has it the simplest because there is only one operation - recording of the card's contents onto the hard disc which is done with a single button. A folder is created on the disc, and data start being transferred. The folder gets its number (from 1 to 999) that is why it can be a limitation only for 16MB cards - 999 cards of 32MB amount to 30 GB. No record checks are done. Some users say that some files from large cards are transferred incorrectly, that is why it's better to repeat the procedure. The LED blinks while data are transferred. Don't eject the card at this time :) The data are just copied, that is why you have to clear it yourself. Other operations are possible only after connecting the drive to the computer. The Digital Album is a more advanced device is this respect. Data start being copied right after you select Copy in the menu which is the first item there. A folder is also created before the copying process starts; it's possible to monitor it on the LCD. On completion it displays how many files and in what folder are copied. After that you should select the next item Verify (actually, you can do it any time but only the last operation will be checked, that is why it makes no sense to put off it). The verification is quick: the drive compares files names, size and some other characteristics, which is quite enough compared to byte-to-byte comparison. If it's successful, the drive offers to clear the card. If it doesn't offer it, you should repeat the copying and verification procedures. If it's ok, the card is ready for further use - you don't have to clear it manually. The drive supports some other operations, but it needs to be connected to TV. The Picture Pad is all about the same. The only additional option is that you can format a flash card (if you don't want to do it in the camera). But when files are transferred to the drive, there are a lot of operations we can do with them. Just go to the File Options though View File List or View Thumbnails in the main menu. The first three items - Cut, Copy and Past - make possible to move or copy files from one directory to another. "Delete" moves them to the recycle bin, that is why you can restore them if necessary (the bin is a usual folder and its files can be moved or copied a usual way). "Rename" invokes a virtual keyboard which is not very handy, but suitable for typing file names. All file operations are applicable both to files and folders. New Folder also uses a virtual keyboard. Empty Recycle Folder makes restoration of files impossible. The Picture Pad uses caching of files, which makes shorter access to files viewed before (if you applied some operations, for example, rotation, the image will be saved with the changes). If the cache is too big already, apply Delete Cache Files. 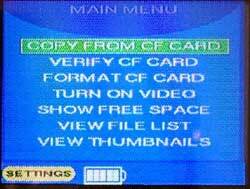 Above all, there is one more item named Copy To CF Card. It is very convenient if you must give some files to someone. Or if your PDA and camera use different card types, you can copy files from one card to another via the Picture Pad with an appropriate adapter and then view them or edit on the PDA. The PDA's screen is still a little bigger, and you can also send photos by email. 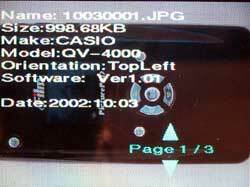 The manufacturer warns that it's possible that the camera doesn't show files transferred this way. If the card is full you will be notified. If the card has a file with such name, you can either overwrite it or cancel the operation, rename it and copy again. The error procession is excellent. In general, the file operations are not superficial. Let's start with the X's-Drive - this drive has 8 LEDs and nothing more. 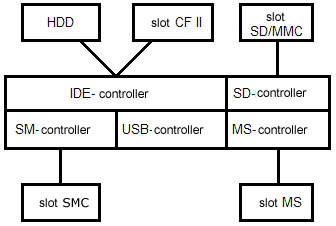 Four of them indicate usage of a respective carrier: HDD, CF, SMC or SD/MMC/MS. They go on when a respective card is inserted and start blinking when data are transferred. One is always on when the device is switched on, another indicates battery recharging, the third one warns that a battery level is low and the last one informs about an error in data transfer or that the card is full. The Digital Album and the Picture Pad are more advanced. The LCD shows information about the battery status, indicates that the device is connected to a PC or a power supply unit. All operations are followed by clear comments and progress indicators so that you can know how long you must way until the end. There is also a couple of LEDs just in case - one indicates recharging and the other - data delivery. Without additional equipment it's supported only in the Picture Pad. Apart from just viewing you can rescale and rotate images. You can shift from one image to another manually (Manual Slideshow) or automatically (Automatic Slideshow). In the first mode you can display EXIF information. Also, you can draw a histogram. JP`EG (progressive), TIFF (any size possible in modern cameras) and RAW of some cameras (their number keeps on growing up in new firmware versions) are supported. The screen is rather small, but it can be solved. The Digital Album and the Picture Pad can be connected to TV: the former with the dock station and the latter directly. PAL and NTSC are supported, - they can be set manually. The Picture Pad doesn't benefit from TV but for a big screen. The Digital Album receives all Picture Pad's functions of file management and almost all viewing options (except EXIF info and histograms). So, while on leave you can shoot nature all day long and when you are back in the hotel in the evening you can look though your shots, delete those you don't need etc. It can be very useful; I wish it could do the same without the dock. The Digital Album and the Picture Pad support firmware update, and note that new versions are often released. However, I can't say there are a lot of changes because there weren't many errors from the very beginning. Some new things get support, for example, RAW formats of new cameras, printers, cards compatibility gets better. In general, the device can grow both at the expense of additional expansion modules and sophisticated software. The X's-Drive consumes 360 mA in operation, 175 mA in the standby mode. The full battery suffices for two and a half hours of operation (on average). The manufacturer affirms that it's enough for recording 42 128MB cards (it's about 5 GB). For the Digital Album the company says only that the battery can suffice for 30 64 MB cards (about 2 GB). 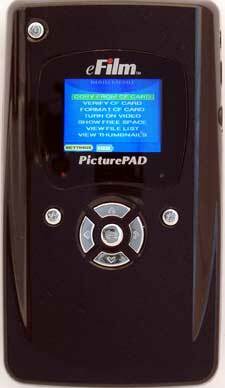 The Picture Pad can work 70 minutes with slide-show or rewrite 45 64MB cards (about 3 GB). The figures are not that good. Only the X's-Drive promises more or less solid results. If it were really so, it would be better to get flash for the same money. But actually even the Digital Album can write 3-5 GB of photos (3 from Microdrive and 5 from flash). Why did the companies understate the figures? First of all, this is the guaranteed time. You can always count on it. Secondly, a lot depends on a card size. If they say that the battery can be used for 42 128MB cards, it doesn't mean that in case of 512MB cards the battery will run off with the 11th one - most likely, you can use about 20 such cards, because spin-up and spin-down of a hard drive take more power than rotation, and they take place less often in case of more sizable cards. Besides, you will have to turn on the device less often. I managed to carry out 26 finished operations with the X's-Drive and 512MB cards without switching on/off the drive. Also, I measured the maximum operating time of the batteries with HD Tach (with external power supply off): the Picture Pad can record via USB 20 GB and read 35 GB. Of course, it will be less in reality, but anyway you can count on at least 5-7 GB. If you need more per day, you can get one or several extra batteries as it's quite simple to replace them. 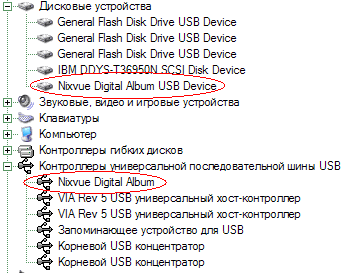 So, the Nixvue Digital Album is not a good candidate because of the dock and less run-down time. In the stand-by mode it's not much better than the X's-Drive, and one would hardly use much these drives in the stand-by mode. Although the Digital Album has an attractive price, I don't think it's worth buying it today. If it's important to have various frills, you'd better add money and buy a better model, otherwise go with the X's-Drive. X's-Drive is a good choice for budget-concious users who want just the cheapest gadget for storing photos while far from home. The drive is not that bad as a multiformat card reader or an external hard drive. On the other hand, it has a primitive indication system and a low data rate between the drive and a card. If they release an updated USB 2.0 model, it will be simpler to make a choice in its favor. Any of these drives can at least help a user, not necessarily well-off, to make thousands of shots far from home with a digital photo camera. Actually, you are to choose between inexpensive simplicity and rather dear functionality. 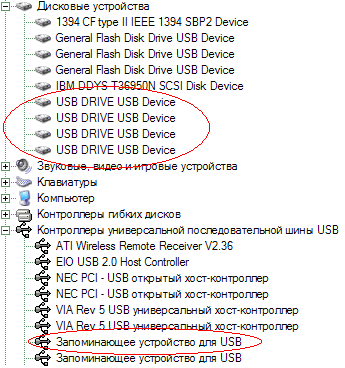 But anyway, the idea to use such drives is rational and in the very end it will let you save some money.